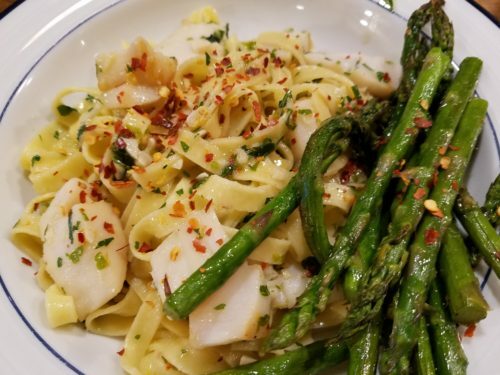 I served this delicious pasta dish with some yummy asparagus, simply cooked with some olive oil and salt… very springy!! Bring a large pot of salted water to a boil. Add the pasta and cook according to package label and reserve ½ cup cooking water, then drain and keep aside. In the meantime, heat the oil in a large skillet over medium heat. Brown the scallops on both sides about 30 seconds each. Take out and keep aside, let cool and slice each scallop into 3 to 4 slices. Reheat the pan on medium heat and add the garlic, red pepper flakes and ½ teaspoon salt. Cook for about a minute. Add the clam juice, lemon zest and juice. Add the pasta and the pasta water. Add the scallops and parsley, toss to coat and cook for another minute or two until the scallops have warmed through. Season with salt and pepper. Drizzle with a bit of olive oil before serving. 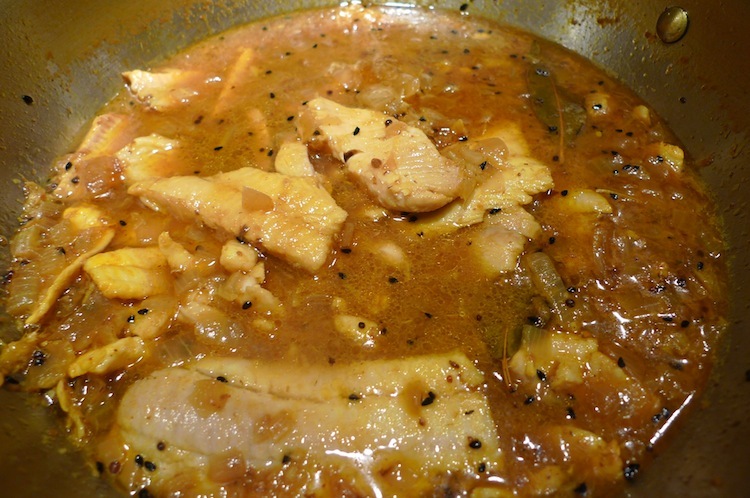 Marinate the fish fillets with the lemon juice, turmeric and salt. Heat a non stick pan with the 2 tablespoons coconut oil. Saute the fish pieces briefly on high heat. Keep aside. Add the leftover oil from the non-stick pan to a saucepan and add the remaining coconut oil. Heat the pan and add the mustard and onion seeds on medium heat. Saute for a minute. Add the garlic and ginger and sauté for 2 to 3 minutes. Add the onions, coriander powder and bay leaf. Saute for 4 to 5 minutes. Add the liquid and salt and bring to a boil. Add the fish pieces and simmer for a few minutes till the fish is cooked through but not over done. Check for seasonings and serve with rice. Heat a large saucepan with the olive oil. Saute the shrimp on high heat for 30 seconds on each side. Sprinkle salt and take out onto a lined platter. Cut each shrimp into three and keep aside. Add the pancetta into the same saucepan and sauté over medium heat for 2 to 3 minutes. Add the shallots, garlic and carrots. Saute for another 2 minutes. Add the thyme and tomato paste and cook for 2 minutes. Add the flour and cook for another 2 to 3 minutes. Add the white wine and scrape off the brown bits from the bottom. Add the broth and milk. Whisk the liquid on high heat and bring to a boil making sure all the lumps are smoothed away. Lower the heat and cook for 10 to 15 minutes. Add the shrimp pieces and cook for 2 to 3 minutes making sure the shrimp is cooked. Add the half and half and turn the heat off. Check for seasonings and add salt if necessary. Add the lemon juice and serve hot with crusty bread. Sprinkle the bay seasoning and salt on the shrimp and keep in refrigerator for 2 to 3 hours. Heat the olive oil in a large saucepan. Add the flour and cook on medium heat to create a brownish red roux- it should take about 6 to 7 minutes. Add the onion, garlic, green pepper, celery, thyme and bay. Saute on medium heat for about 10 minutes. Add the white wine, tomato sauce and chicken broth. Add the okra and sausage. Break the sausage with the back of spatula. Bring to a boil and lower the heat. Place the cover and cook for 20 minutes. Take the lid off and cook for another ten minutes. Check for seasonings. Add the shrimp and cook for another 5 to 7 minutes. Garnish with parsley and serve with rice. Line a cookie sheet with aluminum foil. Transfer the vegetables onto the sheet and drizzle olive oil. Sprinkle salt and pepper and roast for about 30 minutes until the peppers and onion are soft. Let cool and carefully take the pepper skins off. 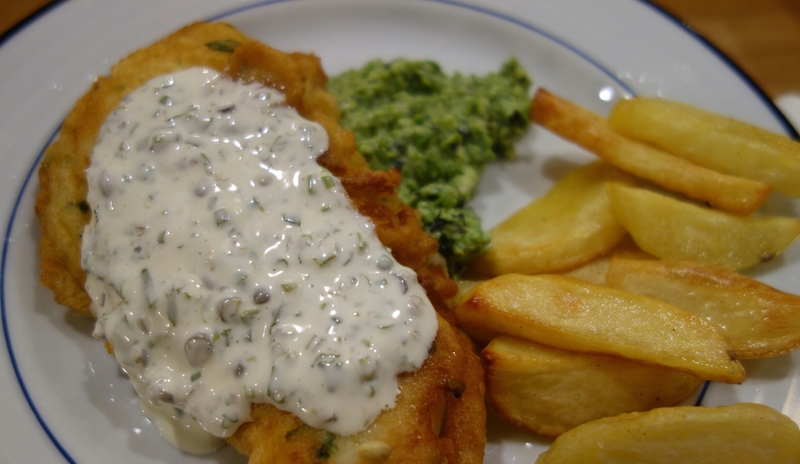 Place in a blender with the cilantro and broth. Blend till smooth. Keep aside. Heat a large saucepan with olive oil. Saute the shrimp on high heat for 30 seconds on each side. Take out and sprinkle with salt and smoked paprika. Add the blended sauce and sauté on medium heat for 5 to 6 minutes. Add the half and half and broth. Bring to a boil and add the shrimp. Cook on medium heat for just a few minutes till the shrimp are done- careful not to overcook. Check for seasonings and garnish with cilantro. Serve with fresh polenta. Heat a large saucepan with the olive oil. Add the shrimp and sauté for a minute. Take them out on a platter and sprinkle some salt. Cut the shrimp in half and keep aside. Add the chimichurri sauce into the pan and saute for a minute. Add the coconut milk and chicken broth. Bring to a boil. Add the rice and bring to a boil. Lower the heat as holes begin to appear on the surface. Cover the pan and cook for 15 minutes. 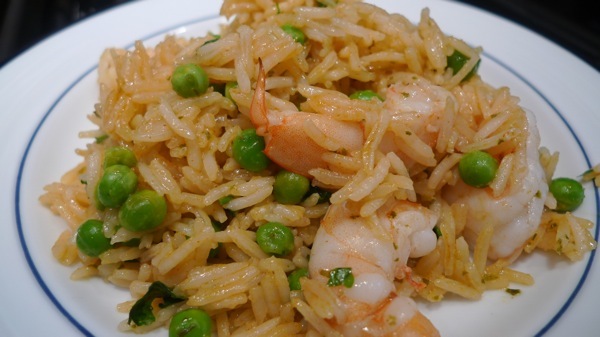 Add the peas and shrimp on top and cover with lid. Cook for another 10 minutes or till the shrimp is fully cooked. Mix well and add salt, lemon juice and cilantro. Mix well and serve hot.